All of my family was able to make to our house. We had 11 people, a 16-pound bird, all the trimmings, and much to be thankful for. I didn’t do anything fancy with the bird this year. Two days out I mixed my Poultry Rub with 1/2 olive oil and let that steep overnight. The next day I removed the giblets, slathered the bird inside and out (and under the skin a bit) with the wet rub, sealed it in a zip-top bag, and stashed it in the fridge until 2 hours before it was time to put it on the grill. Two hours before my (alleged) 4-hour cook, I removed the bird from the bag, set it on a rack set in a disposable roasting pan, and moved it back into the fridge to air dry a bit. I set up the Big Green Egg for an indirect cook at 350°F using an inverted plate setter to diffuse the heat. When the grill was up to temp, I moved the roaster with the bird in it out to the Egg and set it directly on the plate setter. 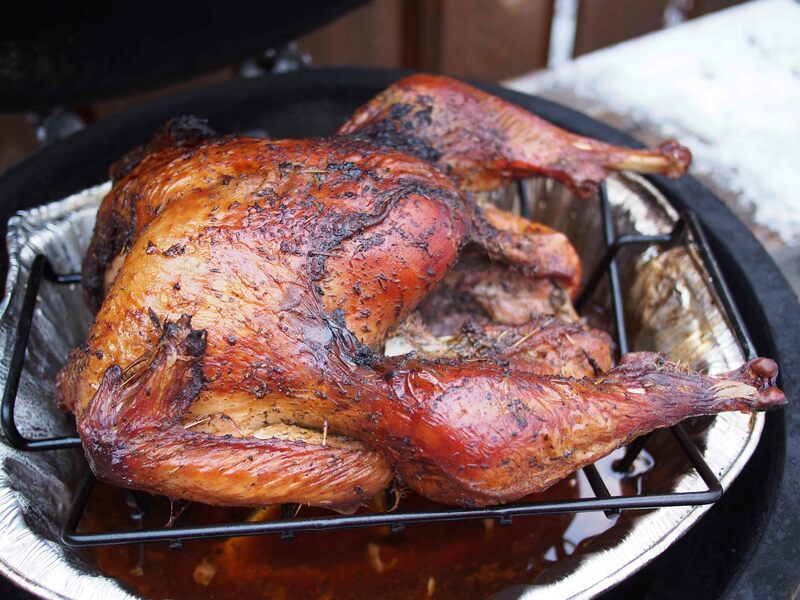 I knew from experience that within 20 minutes of putting the bird on, I could have the vents adjusted just so and the BGE would tick right along at 350°F for hours unattended. That way I could work on finishing touches (and maybe catch a nap) and the bird would take care of itself. But just to be on the safe side (after all, this is a once-a-year dinner for 11 people) I set up my new Maverick ET732 Wireless Thermometer to keep an eye the temperature. This unit recently replaced my old trusty Maverick ET-73 when its LCD display finally died. 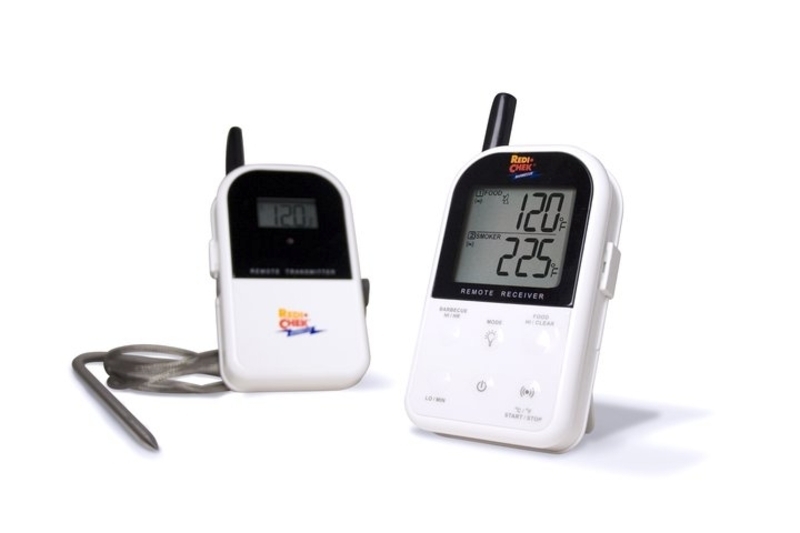 Like its predecessor, the ET-732 has two temperature probes that monitor the temperature of both the meat and the cooker and transmits them to a portable receiver. It also has two alarms that can be set independently – one goes off if the temperature of the cooker goes above or below a range that you set, and another goes off when the temperature of the meat reaches your preset internal temperature. So when we were two hours into the cook and the remote started beeping, I knew something was wrong. I checked the display and it showed that the bird had already hit 150°F in the breast. I rushed out to the grill and did some wiggling of leg joints and probing with an instant-read Thermapen to confirm what the Maverick is telling me. Sure enough, the bird was done a full two hours early. I moved the roaster off the Egg and took it inside. Fortunately my dear wife had picked up an extra disposable roasting pan, so we covered the bird with that and wrapped the whole works with some beach towels. I kept the Egg running at 350°F. By the time everyone had arrived the bird had cooled off a bit, so I just popped it back on the grill for 10 minutes to get it up to serving temp. Despite finishing early and being re-heated at the last minute, the bird was very juicy with crisper skin than I would have expected. The wet rub was outstanding – very herby and savory. A couple of people commented that it didn’t taste like what they’re used to turkey tasting like. Considering some of the cardboard birds we’ve eaten over the years, I’ll take that as a compliment. Don’t worry about the turkey – four ounces of turkey breast meat is only 120 calories and 4 Weight Watchers Points. Worry about the stuffing and gravy instead ;). This is a nice improvement over the previous model. The range has been extended to 300 feet and the probe wires are heat resistant to 700°F. My only nit to pick is that the temperature ranges are hard to set because the unit doesn’t have up and down buttons. Considering that this baby saved our bird, I am more than happy to overlook this small issue. Next time my generic wireless dies, I’m getting the ET-732. Tired of getting new remote probe thermometers every 6 months. If I had just bought the Maverick it would have been cheaper in the long run. I’m in the market for a new thermometer. This has just gone on my Santa wish list. Thanks for the review Dave. I’m definitely going to pass this on to my husband who does the grilling. I have a meat thermometer in the oven that I use instinctively when I cook meats and just love it. However, he’s been wanting one for the grill for quite a while. Even though he smoked the perfect turkey for Thanksgiving, he has to open the smoker to check the temp. Wouldn’t have love this wireless! Thanks for this post and it looks like you did indeed have the perfect turkey for Thanksgiving! It’s beautiful!